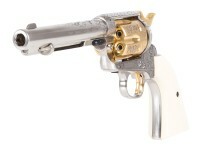 Pyramyd Air is proud to announce the latest Colt Limited Edition hand engraved Peacemaker. In the tradition of the Colt Custom Shop (and before that, the Colt factory engraving shop) the Colt's Patent Fire-Arms Manufacturing Co. has been producing hand engraved models since 1855, and even before that, with engraved guns from Colt dating back to 1836. Those same historic engraving patterns have been reproduced in the 20th and 21st centuries by America's top firearms engravers, including Adams & Adams of Vershire, Vermont. 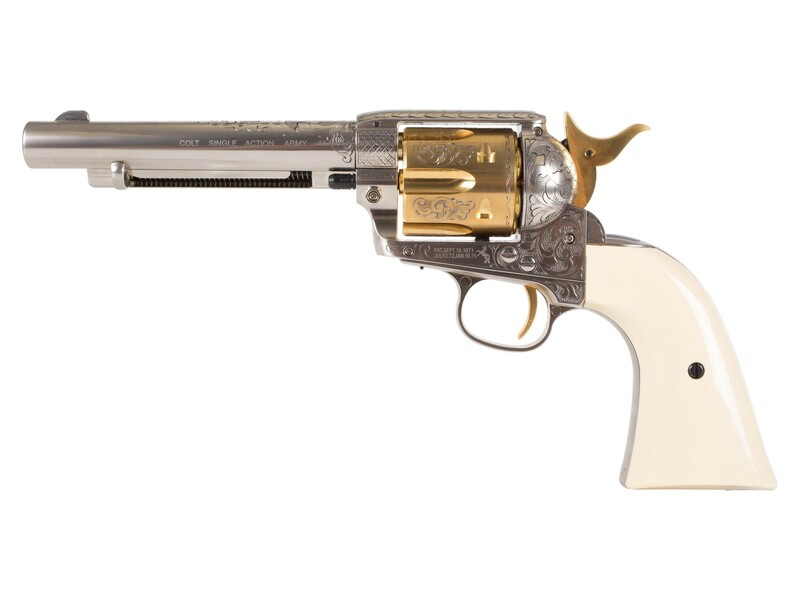 John J. Adams Sr. and his son, John J. Adams, Jr., have both worked for the Colt's Custom Shop and Smith & Wesson's Performance Center, as well as private commissions from many of the top western gun collectors in America. 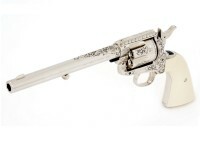 Specializing in the Gustave Young, Cuno A. Helfricht, and Louis Daniel Nimschke engraving styles, the latter is used on this new Limited Edition .177 caliber Nimschke Colt Peacemaker. The designs on this gun are copied from an original Nimschke gun done for Schuyler, Hartley & Graham in the 1870s, and a reproduction of that 7-1/2 inch .45 Colt caliber SAA created by Colt's and Adams & Adams in 2008. L.D. Nimschke's style, and that of the Nimschke Shop, was unique in the combination of engraving elements, and extensive use of punch dot backgrounds to add greater depth to the engraving. Patterns were usually a combination of vine scrolls, sunbursts, crosshatch panels (usually on the side of the frame where it meets the barrel), and use of borders or waves and dots to accent ejector housings and frames. This is the style used by Adams & Adams for the 5-1/2 inch barrel length Umarex Colt Nimschke Peacemaker. The engraving on this gun is also inked in, a process used to accent the engraving on nickel plated (or silver plated) guns. 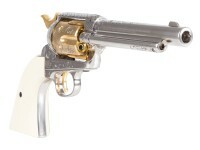 In addition, following the details of the Schuyler, Hartley and Graham 7-1/2 inch Colt, the cylinder, hammer and trigger on the Peacemaker are separately gold plated before the engraving. If gold is not your cup of tea, you can go for the 7-1/2 inch pellet version that is all nickel. The very first airgun to be engraved by Adams & Adams exclusively for Pyramyd Air, it is the most lavishly engraved of all the Umarex Colt Peacemakers. 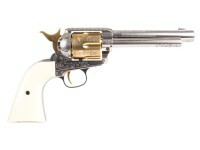 This model will be limited to just 100 guns, each individually numbered and signed by Adams & Adams. Things I liked: This is the best looking gun in my collection... and I have several. The artwork is very nice! My hat's off to Adams and Adams. You really done good! Things I would have changed: Not sure why PA chose the bb version over the pellet version. I mean... it's not that big of a deal but most collectors want a rifled barrel if possible. Everyone agrees that with a little more dedication... the grips could be made of a much thicker material, like polymer, to make it FEEL more realistic. What others should know: The artwork on this gun makes up for the minor details mentioned in my THINGS I WOULD CHANGE section. I am glad I went ahead and pulled the trigger on this gun. I'm even thinking about buying another to put them in my SASS holster. They would really look good as a set. Things I liked: The quality of the engraving is exceptional. Sure to be a collectors item at 100 off. A little on the expensive side for a Co2 gun but its the Adams and Adams artful engraving that your really paying for. What others should know: Collectors - keep the box and accessories intact. If these guns are the same as the real thing then could I buy the wooden or ivory grips from the "COLT COMPANY" so I would have a VERY nice gun indeed? I noticed you can get this gun in bb or pellet. The pellet version has a rifled barrel. Does that mean there will be 50 of each or 100 of each???. The ad says 100 total. But want to be sure of the amount before ordering.